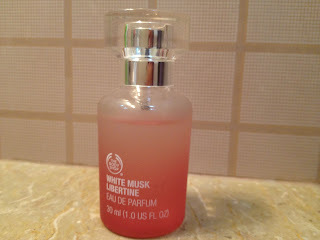 Well I adore fruity, floral and sweet fragrances today I m going to talk about The Body Shop White Musk Libertine. They launched this line in Pakistan last year and there are five products included in it. I got White Musk Libertine as a gift at first I thought it will be all musky but the name contradicts the smell it is very light and decent. As I don’t like the original white musk it was too heavy and strong for me but I like this lighter version of it. The best part of this perfume is that my husband likes it more than I do which is a plus because he hates almost every other perfume I have. Therefore whenever he is around I use this one =p. It is fresh and perfect for everyday use not for the special occasions (in my opinion). The lasting power of this perfume is average because I can’t smell it after 3 hours or so. 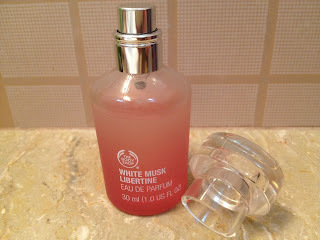 It is worth a try for those girls who like sweet and musky fragrances. 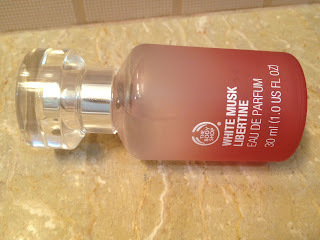 In my thought white musk libertine is better than body shop’s perfume Love Etc. The bottle of white Musk libertine is nice light weighted and small can easily fit into purse. You can get this perfume from any Body Shop outlet in Pakistan for more or less Rs 2600. What The Body Shop says about it! A bold new twist on musk, this sensual eau de perfume features a heady blend of cruelty-free musks at its top, heart and base, with sweet notes of Turkish delight, baby orchid and Chantilly cream.